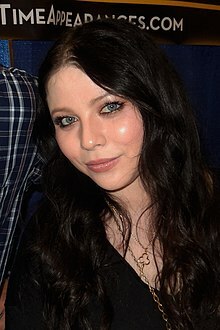 Michelle Christine Trachtenberg (/ˈtræktənbɜːrɡ/ TRAK-tən-bərg; born October 11, 1985) is an American actress. She is best known for playing the lead role of Harriet M. Welsch in Harriet the Spy, Nona F. Mecklenberg in The Adventures of Pete & Pete, Dawn Summers in Buffy the Vampire Slayer, and Georgina Sparks in Gossip Girl. Michelle Christine Trachtenberg was born on October 11, 1985, in New York City, the youngest of two daughters of Lana, a bank manager, and Michael Trachtenberg, a fiber-optics engineer. Her Jewish parents are immigrants from Germany and Russia. Trachtenberg had a religious upbringing, and her grandparents reside in Israel. She was raised with her older sister Irene in Sheepshead Bay, Brooklyn, where she attended junior high school at The Bay Academy for the Arts and Sciences. She later attended Notre Dame High School in Sherman Oaks, California. Trachtenberg made her first television appearance at the age of three, in a commercial for Wisk detergent. She went on to feature in over 100 more commercials. She appeared in her first credited role as Nona F. Mecklenberg on the Nickelodeon series The Adventures of Pete & Pete from 1994 until 1996. During the same period she played Lily Montgomery on the soap opera All My Children. Trachtenberg's film career began in 1996 with the title role in Harriet the Spy. During this time, she also began a recurring role in season two of the television series The Adventures of Pete & Pete, of which she later became a regular. She then starred in the short-lived television series Meego, which garnered her a Young Artist Award. She returned to film in 1999 for Inspector Gadget. She also starred in the film Can't Be Heaven. In the summer of 2000, she took on the role of Dawn Summers in Buffy the Vampire Slayer, remaining in the role until the show ended in 2003. She also hosted the Discovery Kids series Truth or Scare from 2001 to 2003. After Buffy and Truth or Scare, Trachtenberg appeared in the comedy film EuroTrip. She also had a recurring role in the HBO series Six Feet Under as Celeste, a spoiled pop star for whom Keith Charles served as a bodyguard. In March 2005, she played the title character in Walt Disney Pictures' comedy sports drama Ice Princess. In the film, Trachtenberg played a science whiz named Casey Carlyle, who is torn between a future in academia and her newfound dream of being a professional figure skater. In April 2006, Trachtenberg guest-starred in the episode of House, "Safe". She revealed on the December 22, 2006, episode of Late Night with Conan O'Brien that House was her favorite show, and that she was friends with one of the producers and had asked to be a guest star. In November 2006, Trachtenberg guest starred in season six of the crime drama Law & Order: Criminal Intent. In the episode "Weeping Willow", she played the role of Willow, a kidnapped video blogger, likely based on lonelygirl15. Trachtenberg also appeared in the Fall Out Boy music video for "This Ain't a Scene, It's an Arms Race", the Joaquin Phoenix-directed music video for "Tired of Being Sorry" by Ringside, and the video for the Trapt song "Echo". In 2006, Trachtenberg starred in Black Christmas, the remake of the 1974 slasher of the same name. In 2007, she was cast as the female lead in an ABC comedy pilot called The Hill, based on the newspaper of the same name in Washington, D.C. She provided the voice of Tika Waylan for Dragonlance: Dragons of Autumn Twilight, a direct-to-video animated film based on the novel of the same name. Trachtenberg appeared on The CW hit show Gossip Girl as Georgina Sparks, who recently left rehab and brings back the dark past Serena van der Woodsen desperately wants to leave behind. She returned to the show for a multiple-episode story arc towards the end of season two. Trachtenberg appeared in the season-three finale and in season four. She also appeared several times in season five, and in almost every episode of season six, the show's final season. In 2009, Trachtenberg was a cast member on the NBC drama Mercy; the series lasted one season. On June 9, 2011, Trachtenberg guest-starred on Love Bites as Jodie, who, after being unceremoniously dumped, decides – with a vengeance – to accept her ex's offer to "be friends". She reprised the role on June 16, 2011, and in the series finale on July 21, 2011. In the same year Trachtenberg was a guest-star on Weeds during its seventh season, portraying Emma, a rival pot dealer who causes problems for Silas Botwin. In June 2012, Trachtenberg was cast in the film The Scribbler, produced by Gabriel Cowan. In the Criminal Minds episode "Zugzwang", Trachtenberg played Diane Turner, the criminal stalker to Spencer Reid's girlfriend, Maeve Donovan. She returned to film with the 2009 film 17 Again. She also had a small role in the comedy film Cop Out. In March 2011, she was the featured cover girl in Maxim. In early April 2017, Trachtenberg explained to Entertainment Weekly the backlash her Buffy character Dawn received from fans over the years. 1993 Clarissa Explains It All Elsie Soaperstein Episode: "Babysitting"
1996 Dave's World Angela Episode: "Solitaire"
1996 Space Cases Prankster #1 Episode: "All You Can Eaty"
1998 Blue's Clues Herself Episode: "Blue's Birthday"
1998 Reading Rainbow Herself (voice) Episode: "Math Curse"
1998 Guys Like Us Katie Episode: "Maestro's First Crush"
2006 House Melinda Bardach Episode: "Safe"
2006 Law & Order: Criminal Intent Lisa Willow Tyler Episode: "Weeping Willow"
2013 Criminal Minds Diane Turner Episode: "Zugzwang"
2013 NCIS: Los Angeles Lily Lockhart Episode: "Merry Evasion"
2015 Sleepy Hollow Abigail Adams Episode: "Pittura Infamante"
2015 SuperMansion Blood Moon (voice) Episode: "A Midsummer Night's Ream"